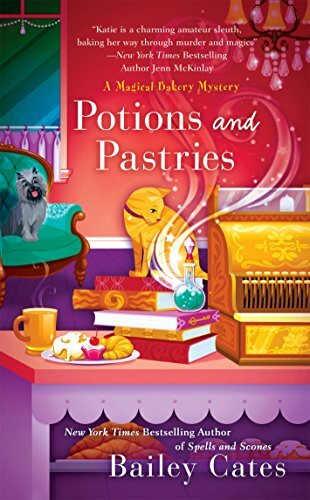 In this New York Times bestselling mystery series, witch Katie Lightfoot bakes enchanted treats—and faces more than her fair share of toil and trouble…. It’s been exactly two years since Katie and her aunt and uncle opened the Honeybee Bakery, where they serve delicious—and bespelled—treats to the good people of Savannah. After a dinner celebrating the bakery’s anniversary, they all take a stroll along the waterfront and meet Aunt Lucy’s friend Orla, a colorful character who has been telling the fortunes of locals and tourists alike for years. The next day, Orla meets with what seems like a terrible accident, but Katie’s witchy intuition tells her it was something more sinister. Together with her trustworthy coven and her firefighter boyfriend, she’ll race to find out what happened to the unfortunate fortune-teller before the piping hot trail goes cold…. Bailey Cates believes magic is all around us if we only look for it. She studied philosophy, English and history and has held a variety of positions ranging from driver’s license examiner to soap maker. She traveled the world as a localization program manager for Microsoft, but now sticks close to home where she writes two mystery series, tends to a dozen garden beds, bakes up a storm and plays the occasional round of golf. Having apprenticed with a master herbalist for a year, she’s prone to concocting teas and tinctures for family and friends from the stash of herbs stored in the corner cabinet in her office. She owns a working spinning wheel and is on a first name basis with several alpacas and two sheep with questionable dispositions. Find out more about Bailey and her books on her webpage here. Follow her on Facebook and Twitter. I am a big fan of Bailey Cates books and am happy you were able to include her and her book on your blog. Looking forward to this magical new release! This was one of the very first series that pulled me into cozies! I love it!!! Awesome series! Can’t wait to read it!